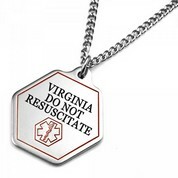 StickyJ Medical ID Jewelry is an authorized provider of Virginia Do Not Resuscitate (DNR) bracelets and pendants. 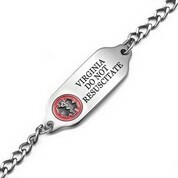 The metal bracelet and pendant each display the words Virginia Do Not Resuscitate on the front along with the emergency medical symbol. Your order must be accompanied by a valid Do Not Resuscitate form signed by both the patient's physician and the patient (or legal surrogate). In the back engraving section, please be sure the patient’s full legal name is entered on the first line, and the physician's name and phone number appears next, followed by the Issue Date of the Virginia Do Not Resuscitate order. You may have additional lines available in which you can enter an emergency contact name and phone number (optional). If you prefer to order by mail, you can download a DNR bracelet or pendant order form by clicking on Virginia DNR Mail Order Form. Or, you can place your order online by selecting an item below. A copy of your completed Virginia DNR Order must be mailed to StickyJ Medical ID prior to releasing your order. You can either scan the document and send it to us by email (CustomerService@StickyJ.com), or fax it to 727-490-5446, or mail it to: Customer Service, StickyJ Medical ID – DNR, 10801 Endeavour Way Unit B, Seminole FL 33777. If you have any questions, please call us at 727-823-9500.